Dye Penetrant Inspection & Testing Services | DPI Testing - Meyer Tool & Mfg. It takes skill and experience to make good welds, but there's still a risk of defects. That's why critical welds are inspected. At Meyer Tool & Mfg., we use a dye penetration test for welding. It's available both as part of our fabrication process and as a standalone service. Whenever product safety depends on weld integrity, penetrant inspection is recommended. ​Liquid penetrant inspection processes rely on capillary action to locate extremely small defects such as cracks, pits and pores. A low-viscosity liquid is drawn into these spaces and can be used to highlight their presence. Various liquids are used for penetrant inspection. At Meyer Tool, we favor the dye method. We have a lot of experience with it and always follow a formal dye penetrant testing procedure. After thorough cleaning, we apply a red dye and allow capillary action to draw it into the voids. The surface is then wiped clean, leaving just the traces our cleaning can't reach. Next, we apply a white developer. This extracts the dye, making it spread like water absorbed by a paper towel. The red stands out against the white, showing where attention is needed. Liquid penetrant testing is for more than welds. It's also an excellent means of checking the integrity of castings — especially those that will be used for fluid handling such as pump and valve bodies. ​Welding takes a lot of skill and experience. Yet no matter how good the welder, defects can still occur. Inclusions or impurities in the metals being joined can cause porosity. Additionally, contraction during cooling may lead to cracking. Porosity is a problem in casting, too, as are flow lines where the metal isn't properly fused. Trapped gasses and variable pouring speeds are often the culprits and, by nature, hard to predict. ​The need for weld inspection is application-driven. Cyclic loads can make a small defect propagate through the length of a weld. A defective weld could let a storage tank leak hazardous fluids or leave a vacuum chamber unable to achieve the required pressure. Pressure vessels are a particular challenge, as the smallest weakness could lead to a devastating explosion. Why Use Liquid Penetrant Testing? Liquid methods are well-proven and reliable. They're not costly, don't need highly specialized equipment, and pose minimal health risks. Because it's fast and inexpensive, good welders often perform their own liquid penetrant inspection before passing a fabrication or weldment over to the next process. 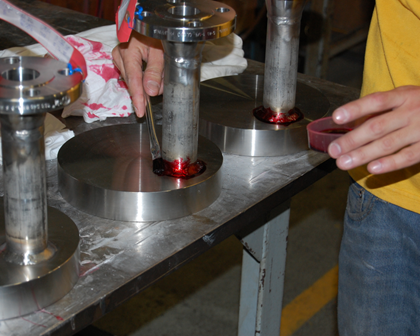 ​We do a lot of dye penetrant testing at Meyer Tool. That's to ensure every assembly and fabrication that leaves our facility is safe and fully functional. If you'd like to know more about our testing procedures, please contact us. We'll be happy to explain. Also, if you have parts that should go through a formal dye penetrant testing procedure, we can help.